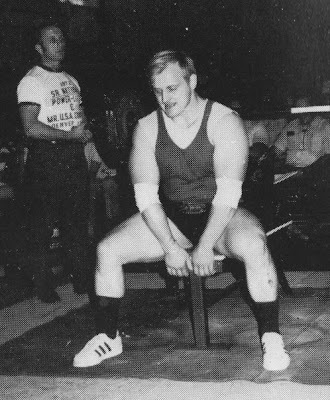 He struggled from the squat rack, burdened by the load on the bar. It flexed as he shuffled back a few steps. 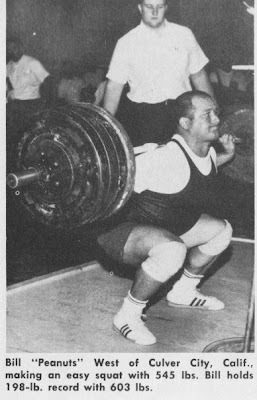 A couple big breaths, and started into his squat. And then, suddenly, he veered to one side and fell. The ponderous weight crashed to the floor, guided away from him by two spotters, who fortunately, were on their toes. This is an actual scene that I witnessed, and it was certainly not unique. It brought back memories of times when I had lost my balance and missed lifts when competing as well as while training. How many times have you been off-balance, causing you to lose the weight? At best you have missed an attempt; at worst you may have injured yourself. Such loss of balance can be the result of poor ‘grounding’. Grounding is a key concept in the branch of psychology known as bioenergetics. It means, literally, to be in touch with the ground. The idea is that you cannot produce, accumulate and direct your energy well unless you are solidly planted. To be ungrounded is to be ‘up in the air’ without adequate support. An extreme example of being ungrounded is a person in a zero-gravity situation. Maybe you can remember seeing films of astronauts in zero-gravity, floating about, unable to exert more than a few ounces of force against anything without pushing or pulling themselves around. Contrast this with how strongly the same persons could push or pull with their feet solidly grounded on ‘terra firma’. The ancients recognized the importance of being firmly rooted, as shown in one of the exploits of Hercules. It seems there was a giant named Antaeus, who was fond of wrestling. His game was to force strangers to wrestle him, on the condition that if he won, he should kill them. In this way he was collecting skulls to roof a temple. As long as he could touch the ground he was invincible. Each time he was thrown to the ground he arose with renewed strength from the contact with Earth. You could say his strength came from his grounding. Hercules had his hands full with this guy. Each time Herc threw him down, Antaeus came back all the stronger. Finally catching on, Hercules lifted Antaeus into the air, and holding him off the ground, strangled him. The moral? The grounded athlete has the advantage. For the lifter, grounding means to have one’s feet firmly planted on the floor. It means to have one’s legs and feet solidly under one in order to support the lifting. 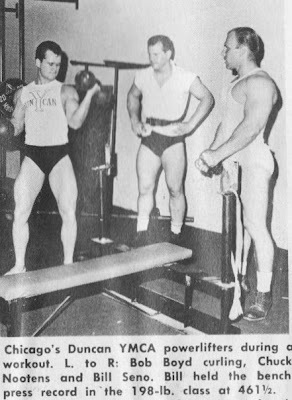 In the case of bench pressing, the bench becomes an extension of the floor, and grounding involves the contact of one’s back to the bench as well as one’s feet to the floor. Whether standing or lying on a bench, grounding provides the stability needed for maximal lifting. Here is an exercise to develop skill in grounding. Do the exercise slowly, paying very close attention to each step. Stand barefooted on a smooth, solid, hard surface. Place your feet at a comfortable distance from each other, about shoulder width. Unlock your knees. Close your eyes. Breathe comfortably. Feel the floor under you. Explore the floor by wiggling your toes. Shift your weight to the balls of your feet, then to your heels. Shift your weight to one foot, then the other. Let your energy ‘sink’ down through your legs and through your feet to the floor. Practicing this exercise will give you the ability to ‘ground’ yourself in just a moment or two in almost any situation. Now for some specific hints in grounding for powerlifting. THESE TECHNIQUES CAN BE ADAPTED TO ALL LIFTS. Walk to the bar and place your feet at the width that is most comfortable to you, given your style of deadlifting. Learn your strongest, most comfortable width by experimenting, and then keep it constant. Changes of even an inch will affect your grounding. Take this stance at a distance from the bar which gives you your best leverage. Take time to move your feet until you find your exact best stance. Bend your knees slightly and feel the floor under you. Shift your weight slightly from one foot to the other, then equalize it between your two feet. Feel the energy flowing up and down your whole body, connecting your entire body from hands to feet. Do not move your feet from the grounded position until the lift is completed. There are two variations on grounding for the deadlift which are required for the squat. First, the grounding sequence is done after the bar is positioned on your back and after your hands are firmly gripped on the bar. If you do not do this, you are likely to unground yourself when you reach for the bar and position it. Second, you have to ground yourself twice for the squat. The first time is in preparation to take the bar off the racks; the second time is in preparation to execute the actual lift. In the first grounding you are not supporting the weight, so you can take your time. But, in the second, with all that weight on you, you cannot waste time getting solidly grounded. Learn to do this second grounding quickly and efficiently, and omit any knee bend or body shifting. Simply get your feet set in your accustomed stance and feel the energy travelling through you to the ground and back up. The bench press presents a new challenge for solid grounding since the legs and feet are primarily for stabilizing, while the greatest amount of weight is supported by your upper body. The bench, in this case, as mentioned earlier, is an extension of the floor. So, while bench pressing you will ground through your upper back, your buttocks and your feet. Plant your feet well. Never move your feet or lift them even slightly when bench pressing. This holds true for other seated or lying movements as well. Keep your feet firmly planted in a comfortable setup position to which you are accustomed (use thick plates to build up the floor level if necessary). Find your best back and buttock position, while gripping the bar. Think of the bench itself as an extension of your body. Once you are in your accustomed position maintain it throughout the lift. The simple fact is that if you are not well grounded in any type of lifting, you will lose balance, lose leverage, and therefore lose potential power.